Discover Let's Talk About Texts! A Very LTAT Christmas! Christy, Kara & Megan talk all things Christmas! The age old debate over Love, Actually, holiday party blackouts, and we track down the cast of Home Alone! Come pound eggnog with us! The gals reunite to talk wedding planning and new apartments while they pregame before an engagement celebration for Megan (and Squeege). We’re breezing through our thoughts on all the Housewives franchises plus we get a secret from the amazing Esther Povitsky. Meet us at TomTom! Megan takes us through her recent major life event! BOOMBaby! We also review Widows and catch up on all things Bravo. Plus a secret from our darling Joel Kim Booster! Come at us! The gals talk Thanksgiving blackouts, our top Turkey Day foods, and we discuss the 92 housewives franchises that are currently on. We also trackdown Jesse Bradford and get a secret from the hilarious Eliza Skinner! We’re thankful for you! Megan and Kara recap seeing a living legend LIVE and recommend another horny Vegas show! We also check in on Christy’s apartment search. Plus we find out what Carlton’s been up to and hear a secret from the hilarious Alice Wetterlund! Come to Vegas with us! The gals talk Kara and Megan’s upcoming pilgrimage to see Cher in Vegas, savagely discuss Giada DeLaurentis, and reveal our stances on Disney (World AND Land). Plus what ever happened to ultimate cool girl Sloane Peterson? We’ve got it all, get over here! Christy, Kara and Megan talk worst Halloween costumes, best Housewives Halloween, and, duh, our top candies! Plus we track down the cast of The Craft and get a spooky secret! Come trick or treat with us! We’re talking begrudgingly seeing Drake in concert, the sheer power of hiring and firing people, and #nomakeup selfies that have been filtered into the uncanny valley! We’re also tracking down Balki Bartokomous and getting a secret from Erin Foley! Come get day drunk with us! Megan chased a pumpkin across a parking lot, Christy got trolled by high schoolers, and Kara was shamed for loving candy corn. We’re all having a quite a Halloween season. We discuss which Housewives we follow on IG, discover what happened to the nightmare brother from hell. It’s red wine season, come over! Megan does not love any of the Boys I’ve Loved Before and Kara is unsure if Beyonce and Jay Z’s love is real. We debate wedding bands vs DJs, dissect the RHOA trailer, and discover what happened to 90210’s Emily Valentine! The country’s aflame, drink wine with us! The girls recap a fun Saturday night, Megan attempts a raw vegan diet and Christy is torn about Kourtney Kardshian being a cougar, plus we find out where Destiny’s OTHER children have ended up. Megan toys with taking her shoes off and Kara & Christy wear organic deodorant! We smell great, come over! Kara and Christy get pumped for their joint bday party and Megan talks working with her hero and dog’s namesake. Christy’s going Gaga, Kara’s second brush with Vanderpump Rules, and Megan hit on a female bartender. It was quite a week. Let’s hang! The girls get together to talk eyelashes, starting rumors, and who’s the new RHONY cast member?! We also review our top 3 desserts and find out how Megan almost pooped on her debit card! Plus has the kid from Jerry McGuire crossed over to foreign markets? Come get friendship tattoos with us! Christy, Kara & Megan discuss being fans of Dr. Death, Megan finally getting friended by the Colts and getting that Ring (cam). We cover everything happening this week in the Bravo-verse and find out what happened to a Family Ties icon. Come over, we bought way too much food! 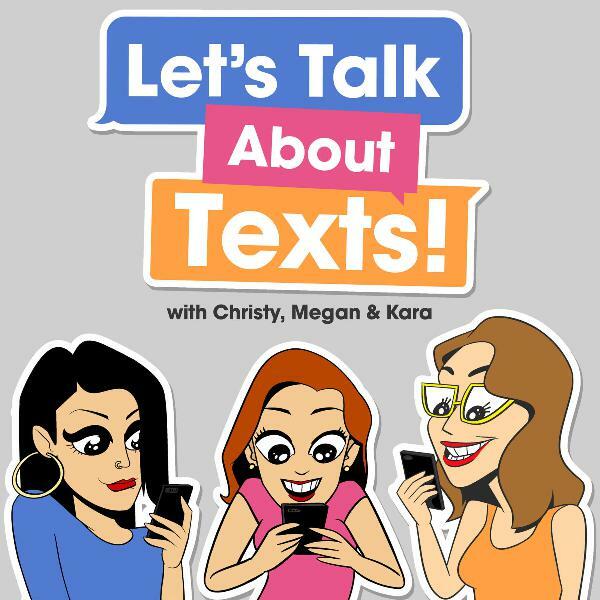 The gals reconnect after a short summer hiatus and they’re talking pizza prefs, time share pitches, airline miles, 30th birthday parties, bridezillas and a million other topics that you can personally relate to! Plus we track down a preeminent 90s heartthrob and hear a secret from the hilarious Alison Leiby. Come to our pool party! The girls discuss Janet Jackson and all the pop stars we're dying to see live, whether it's possible to have a successful open relationship, and criminal mastermind lunch ladies. Then, we find out what Jonathan Taylor Thomas has been up to! Christy, Kara and Megan discuss the finer points of Love Island, the countdown to Crazy Rich Asians, and they explain what is right and wrong to slather on your face. Plus, a Family Matters conspiracy and a prankster secret from America’s Best Mom, Peg Gailey. We love you, never leave us! The girls discuss textual etiquette, if HaloTop is an out-in-public food, and, as usual, dive deep into the Bravo multiverse. We also play 10,000 Follower Pyramid and find out what Steve Guttenberg’s been up to since he ruled 80s and 90s cinema! Come over, bring rosé! On this week’s ep we bow down at the altar of the Mamma Mia sequel, talk karaoke duets and Luann's rehab, recap Megan’s party, and get a secret from Joe Kwaczala. Plus, she was all that but where has Rachel Leigh Cook been, booboo? Stay awhile, we brought food. Christy goes to a wedding, camping with her boyfriend’s family, and gets flashed. Kara and Megan also did some stuff. The girls get psyched up for Mamma Mia 2, dissect Bethenny vs. Carole and discover which famous child star is now a Scientologist! Come over, bring anyone!